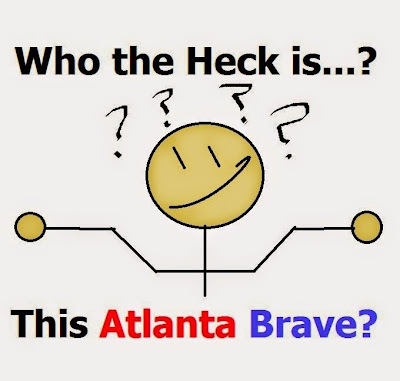 Braves By The Numbers: Who the Heck is Todd Cunningham? And with that question, it made me realize I had to do an article on young Cunningham. So here we go! Many people may think that yesterday's game winning RBI by Cunningham came in his first MLB game. But that's not the case. Todd actually played 8 games back in 2013 when he was called up to the Atlanta Braves at the age of 24. He was purely there as a pinch hitter role, and he got 2 hits and scored 2 runs in his 2013 campaign. A respectable .250 average. However, when he played against the Marlins Friday, he went 3/4 with 2 runs and an RBI. He outdid his previous MLB records in just one game! Todd started in the majors at the age of 21 in 2010 with the Rome Braves. He played decently that year with a .260/.341/.338 slash line. At 22 he advance to A+ ball with Gulf Coast League Braves, and he improved his slugging to .353 on the year. At 23 he advanced again to AA Mississippi where he had his breakout year. Todd hit .309 and slugged .403 in 2012 while he was at Mississippi, putting him on the big club's radar, along with many fans. Next Todd went to AAA Gwinnett, where he struggled a bit at age 23. His OPS fell back to sub-.700 which isn't good enough to make a major league roster. However, that same year he made the MLB club after some injuries to the outfield. But it wasn't long-lived because Todd simply wasn't hitting well at AAA. In 2014, Todd got back to form with a .287/.347/.406 slash. That's the kind of line that gets you a shot in spring training. Todd made some impressions on the club in 2015 spring, hitting .306 during training. That really put him as a front-runner for the Braves MLB team if anything went wrong at the top level. And this last week when Kelly Johnson went on the DL, Todd got his shot. So, I'm rooting for Cunningham. He's not a huge power hitter, but he can be a very productive hitter. After all, there's room on this team for a professional hitter that can really put the pressure on opposing pitchers. Nick Markakis has proven the value of that slot. Go get them Todd, prove your worth at the top level and you may find yourself as a full-time player in 2016.